SOMERVILLE — Abigail Hammond is at a loss for words. Her makeshift family is falling apart. An upended sofa stands in the living room in her first-floor Inman Square apartment — a reminder that one of her roommates is moving out. The three-decker house on Dimick Street that Hammond has lived in for three years is under agreement to be sold, the closing scheduled for mid-August. Already five of the 11 tenants have scrambled to find new housing in order to beat the 20 percent rent increase coming in September and the student rush. Hammond is stuck, not sure whether to stay or go. Hammond and Coutinho share a love for the neighborhoods in which they live and work, but now that affection is mixed with a deep anxiety. As Somerville’s gentrification efforts come to fruition, and with the development of Union Square and the MBTA Green Line extension more certain, the city, once dubbed “Slummerville,” is shedding its undermarket identity. Caught up in the transition are the very folks who help make the community vibrant and diverse — artists, entrepreneurs, college grads, immigrant families, blue-collar workers, young professionals — forcing some to abandon the urban nexus for more affordable housing farther and farther away from the communities they helped build. Think of it as dominoes falling. The “domino effect” in real estate is a chain reaction set off by rising rents and home prices in one community, forcing those who can’t afford to stay to topple, like dominoes, into the next affordable neighborhood. It is common in high-cost metropolitan areas such as Boston, according to Nicolas P. Retsinas, senior lecturer in real estate at the Harvard Business School. Up until the past few years, Somerville has been that affordable neighborhood, an alternative to high-rent Boston and Cambridge, allowing anyone who longed for the vibrancy of a city and proximity to the Hub a piece of property (bought or rented) in exchange for a little grit and a blighted block or two. But that blight has morphed into prettier streets and higher property values. With the constant influx of students and empty-nesters now flocking to Boston, city living is in high demand. Dublin sees local and foreign investors with deep pockets making offers 5 percent to 10 percent or more above asking price. Homes are being sold within days or weeks, not months. “The word I keep coming back to is ‘crazy,’ ” Dublin said. The Dimick Street house was listed at $1.1 million. 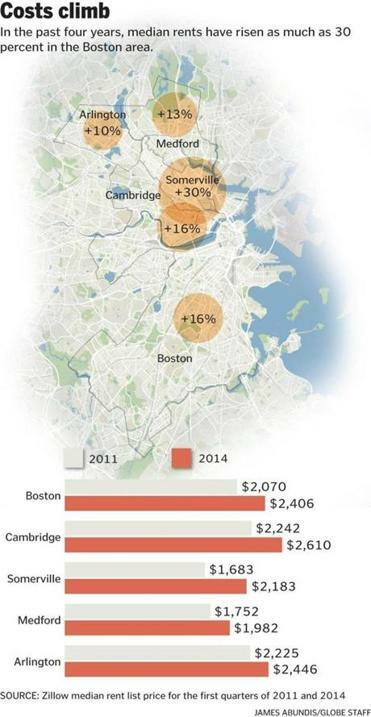 Mirroring that trend: Since 2011, the median, or midpoint, rent in Somerville has jumped by about 30 percent, from $1,683 to $2,183, according to Zillow.com. Medford and Arlington, usually the next stops for affordable housing stock after Somerville, are already seeing increases in home sales and rents. This is forcing folks to look to cities such as Salem and Quincy or even out of state. One out of every two households in Eastern Massachusetts is cost burdened, he said. That’s when you spend more than 30 percent of your income on housing. One out of four is shelling out more than 50 percent. Anastasia Cazabon, a filmmaker and video editor who works at the Brattle Theatre in Harvard Square, is one of the tenants who split from the Dimick Street house. She found a room in a Union Square apartment she’ll share with two others, the same setup as before, but for $100 more. The 30-year-old Cambridge native, however, is fed up with rent increases and the poor conditions of the apartments she can afford. In an e-mail, Cazabon lists “bedbugs, mice, condemned porches, black mold in bathrooms, holes in walls, homeless people living in basements” among the conditions she has endured. Coutinho is a member of Somerville Community Corp., a group that advocates for diversity and sustainable affordable housing. Coutinho has applied for a three-bedroom apartment in Saint Polycarp Village , a new affordable-housing complex with 84 units in Winter Hill. Hammond doesn’t want to leave, either. She can bike to her nutrition-counseling practice near Davis Square. She walks to her yoga classes next to the Market Basket, where she has purchased store-brand items like oatmeal to save money and picked up the occasional 89-cent can of Goya black beans. 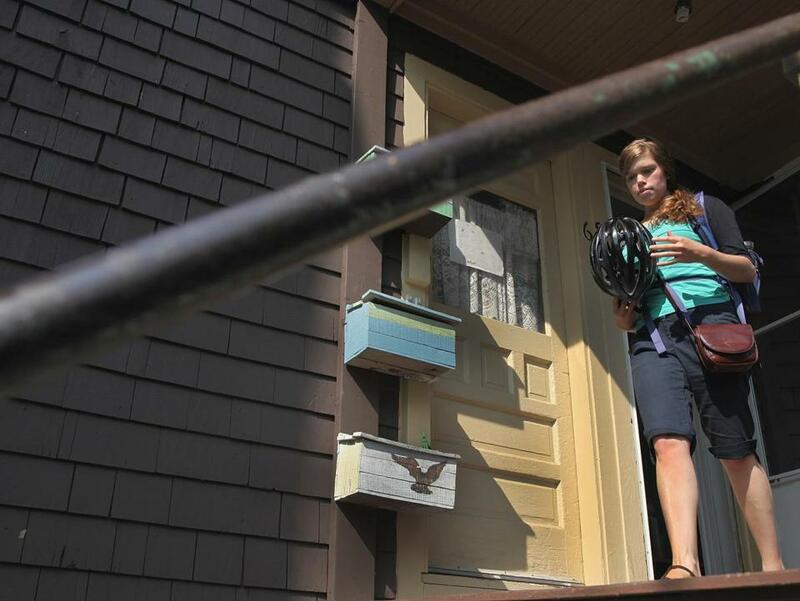 Abigail Hammond’s Somerville apartment is being sold. The 28-year-old yoga instructor’s rent was $550 when she lived in the same neighborhood while in grad school five years ago. In September, she may be paying $900. She lived in the same neighborhood while in grad school at Boston University, paying $550 for rent five years ago. 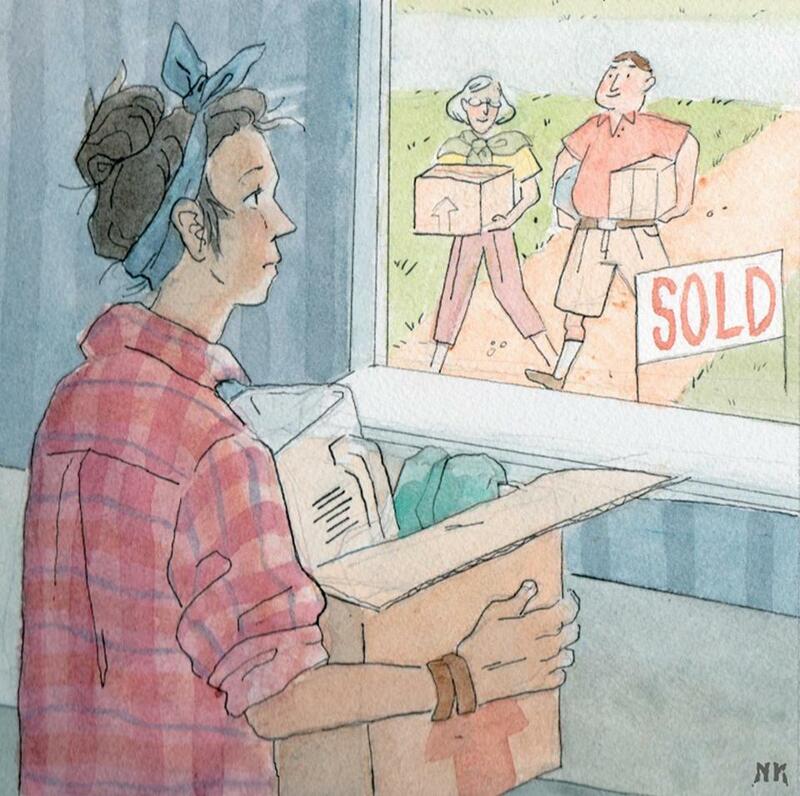 When she moved away to take a job in upstate New York, she lasted two years. “I moved back here for this kind of lifestyle,” she said. Over the past three years she and her housemates shared meals, celebrated birthdays, squeezed lawn chairs onto the patch of grass in the backyard to watch “Pulp Fiction” on a sheet, and held corn-free Fourth of July parties that would make mono-crop protesters proud. When Hammond was making a birthday cheesecake for roommate Yaroslav “Yaro” Tenzer, she borrowed an electric mixer in a pinch. If she stays in the apartment, Hammond faces the 20 percent increase in rent in September, from $750 to $900 — not a lot of dough unless you consider she already spends close to half of her modest income on housing and needs to find another roommate to make it work. If she goes, she needs to invest the time — now — to look for something that won’t uproot her whole life. Naomi Kooker is a Boston-based journalist. Send comments to naomikooker@gmail.com.